Need more information about booking Home 7262359 ? Attention breathtaking view! 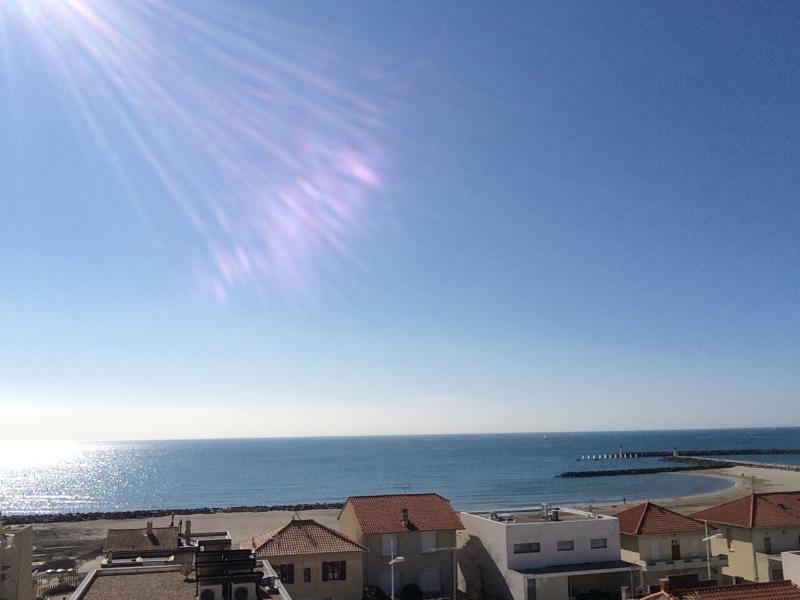 5th and last floor of a south-facing residence, close to all the shops of the port of Carnon like the sea, discover the panoramic view of the Mediterranean offers this super bright furnished studio. resolutely functional and optimized the space of 18 m2 combines both a lounge area with sofa bed, a loft bed, a kitchenette with a ceramic hob with two burners, coffee maker and fridge, and a bathroom with bath and washing machine. Icing on the cake: the terrace of 6 m2 completely renovated veranda-office and integrated with the living space. On the ground, the floor to the boat deck air anchor the seaworthiness of this space bathed in light. Head into the big blue. You can get in touch with Julie (the owner) through the contact form on this page. Send Julie (the owner) an email through the contact form on this page. Alternatively, if there’s a phone number on this page, you can call them. How do I contact Julie (the owner)? If you’ve already booked, go to Manage your holiday booking to view Julie the owner's contact details or send them a message. Or send Julie (the owner) an enquiry through the Contact the owner/manager form if you’d like a quote or more info first. When you pay online through the Book your stay form, a booking request is sent to Julie (the owner). You’ll find out within 24 hours whether they’ve accepted - no money will leave your account before then. You can also request a quote from Julie (the owner) through the contact form. The owner will email you the total cost for your dates and a link to book and pay online. Use the Book your stay form to pay provisionally online. You can pay by credit/debit card or PayPal. Julie (the owner) will have 24 hours to accept the booking and no money will leave your account before then. Why can't I call Julie (the owner) before booking? You’ll need to contact Julie (the owner) to do this. Send them a message in Manage your holiday booking or through the contact form on this page. You can request to change the dates or number of people on your booking via the Manage your holiday booking page. To change your holiday dates use the Edit booking button. If you need to change the number of guests staying then send Julie (the owner) a message. If Julie (the owner) agrees, they’ll send you a revised quote outlining the changes. You can review and accept/decline this from the Manage your holiday booking page. You’ll have 48 hours to take action before the revised quote expires.